On this date in 1888, the “Austerlitz Murderer” — not a Napoleonic figure but an irascible septuagenarian woodsman — hanged in New York. 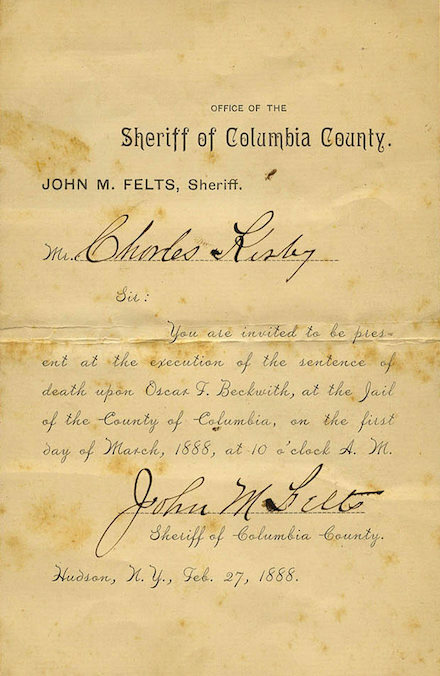 was the killing of Simon A. Vandercook at Austerlitz, Columbia county, in January, 1882. Both men were wood-choppers and quarrelled over a supposed gold mine near the town. The victim’s body was found in Beckwith’s hut, portions of it having been burned. * Beckwith fled to Canada and eluded capture until February, 1885. He was extradited, and while in custody admitted the killing, but claimed that it was done in self-defence. * More specifically, after suspicions were aroused by the awful smell belched by Beckwith’s stovepipe, the body was found hacked up and stashed under Beckwith’s bed, save that “the head, one hand and a foot were gone. The teeth were found in the ashes of the stove.” (Troy Weekly Times, March 1, 1888) This grisly pile spurred (likely baseless) rumors of cannibalism; he’s also sometimes tagged the “Austerlitz Cannibal”.